I can’t believe it is almost a year since the last Square Meal Show. It’s been another very interesting year for the venue & event marketing industry both good and bad. I will be catching up with some old and new faces as well finding out about the latest news and future developments within the industry. I am very pleased to say that our venue & event marketing portfolio is growing and gaining some recognition. This year we are extremely proud to have added the Victory Services Club to our venue marketing client list that already includes Senate House, Kings Place, One Great George Street, Altitude 360, The Mermaid, IOD at 116 Pall Mall, Banks Sadler and Conference Care some of which are incidentally also exhibiting at Square Meal 2011. VSC Marketing Manager Karen Birks has given us some challenging campaign briefs for all her channel marketing including advertising for serving armed forces and veterans membership, renewals, affiliates and member events. The highlight and most happening project right now being the branding of VSC’s venue marketing of their unique event spaces for corporate hire. The ‘Picture Perfect London Venue branded campaign has just been shortlisted for a Meetings Industry Marketing Award MIMA (Category ‘Best Brochure) fingers crossed for 12th October, will be launched officially on Stand G34 at Square Meal at Old Billingsgate on 22/23 September. Also another project that we have been working on this year for our client One Great George Street has also been nominated for a MIMA award (Category ‘Best Direct Marketing Campaign) who will be at stand E33. So fingers crossed again. 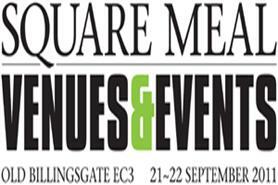 If you are attending Square Meal 2011 and would like to say a quick hi and maybe even find out a little bit more about what we do in the Venue & Events, just drop me a line. The coffee will be on me, off course! Maybe also follow my Design Inc tweets on the day, as I will be reporting on what’s hot and what’s not at the show or even and take a look at our Venue & Events portfolio. The next year or two will see some exciting new developments within the London Venue scene. It is going to be very interesting to see what happens during the year of the Olympics as well as the legacy it will create. The Square Meal Venue & Event show definitely acts as a great barometer for the event industry developments that encompasses the complete event supply chain. If you are considering a creative marketing project for you venue or event and would like to find out how we can support then get in touch and I would be delighted to chat. Have a good Square Meal Show. Be there or be square as they used to say!